Supposedly, this sofa can clock 87 miles per hour, a Guiness world record for fastest furniture. 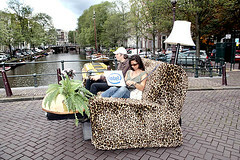 Intel’s picture of the sofa as it crosses a canal in Amsterdam is meant to suggest that with the new Core 2 Duo that digital entertainment is not just for you living room any more. Though somehow given the setting, I’d guess there might be a lot of competition for your attention. Can you guess it, the hack that fetches broad smiles from everybody I’ve shown? This simple idea has been as much fun to show as the very first edition of the Palm pilot 10 years ago. This sandal hack appears quite viral esp. among men that still have some adolescence lurking in them (need I say more? …). 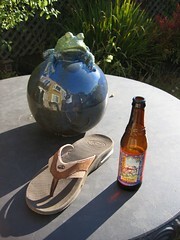 It elicits many more reviews than other sandals everywhere I looked. Other than “Cool, I’ve got to get some!”, guess the next most common response. 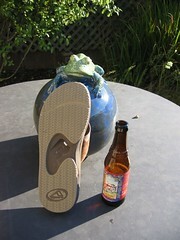 Who would want to drink a beer opened with a beach sandal? I caught the idea myself from my brother-in-law Kevin, but lest you think I’m easy prey, I’ll add that they are quite comfortable with a perfectly snug fit and cushy air heels. “Fat tires, eh, mate?” And I think my daily use cost will eventually match the 99 cent Target flip flops that I also picked up this summer. And on first day of school, I ran into a friend, who also has kids at the same school, and guess what he was wearing?